Whether you are operating a full blown enterprise batch production or single-site production operation, the number of recipes you need to maintain accurately and consistently can be daunting. 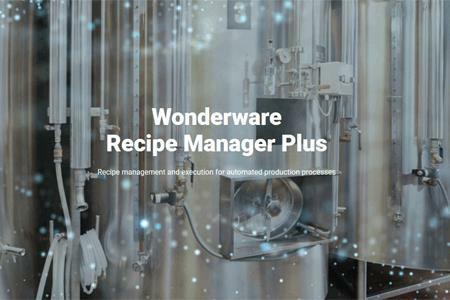 Wonderware Recipe Manager Plus reduces the effort to manage your product formulations and setup specifications on automated production equipment and machines in manufacturing. Powerful, ready-to-use configuration and operator user interface functionality, deep governance – including role-based security, change management with item versioning and approval – and electronic history records offer fast time to value and empower your operational teams to improve productivity and quality. What it is Recipe Manager Plus? This new and unique approach standardizes recipe management, simplifying and speeding introduction of new products to automated production lines. It reduces the number of recipe systems and formats and establishes governance to secure consistent quality of your products. Just download formula parameters and processes to the automation system controlling the appropriate unit, work cells or lines in batch-oriented or hybrid manufacturing processes. You will have everything you need to execute and optimize recipes to your quality specifications. The software is automation system neutral.